How about a horror game which contains audio and none of the gory graphics that we usual tend to think when we think of horror. 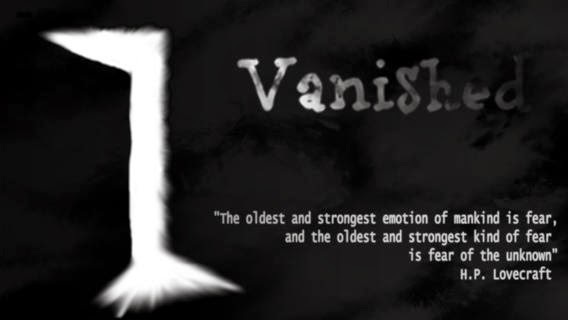 Pixel Heart an independent publisher has made just that and it is called Vanished. As a promo, Pixel Heart is giving out Vanished for free till 1st October. Vanished is the first audio only and a horror game. It plans to scare you through sound and the game play involves you shaking your iPhone to kill the beings or ghosts. When you download the game you will find yourself in a world without light and have no memories of how you got there. Only thing that will be present through out the game is visually haunting audio. The game contains one touch gameplay i.e. you just have to hold your iPhone, face the direction you want to go and touch the screen to walk. Shake the device to attack. It's as simple as that. -Real life simulated combat system. Will you survive a monster apocalypse? Only your skills and reflexes will determinate it! -Fearsome sound effects in 3D audio! -Fully voiced story, narrated by the famous voice actor Peter Baker! -Exp and Level system: grow the strength of your character and get more powerful weapons by killing as many monsters as you can! Pixel Heart claims that the game is a experimental one and if you would prefer to try out this Pixel Heart experiment, try out the Vanishing today on your iPhone, iPad or iPod Touch for free. Download the game from Apple Store.